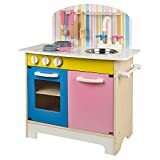 Cookset of spatula, scoop, pot with lid, frying pan, fried egg, salt & pepper pot and oven glove. 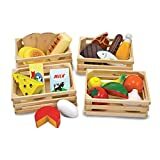 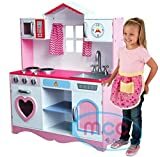 Kids can easily imitate their parents role in the kitchen and adding in their own unique creative elements, your child can use their imagination to understand what really happens when people cook in the kitchen. 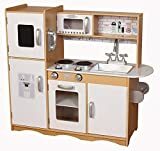 Microwave oven, Stove, Window with Curtain, Removable Sink, 2 Cupboards for storage room. 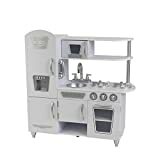 KidKraft 53151 Prairie Kitchen. 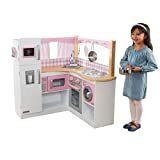 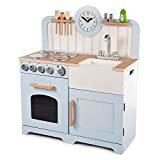 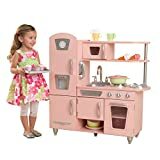 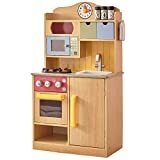 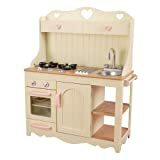 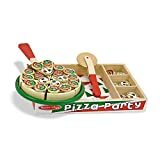 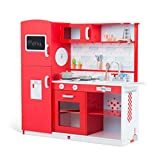 Wooden kids play kitchen with working knobs on oven and removeable sink.